I’m here to guide you. GO grab the closest box or can!! Flip it over and what do you have?? I spy NUTRITION FACTS on the back! This is here to help you make the best decisions possible with the foods that you are putting in your body. Serving Size is the first thing I see! What does this mean? It means the amount that is shown is what the nutrition facts are based on. So if you are eating 2 cups of beans and the serving size is a half cup, you have to multiply everything else on the label by four. Time to get our math skills in shape! What’s next? Calories are used by your body for energy for work, fun and play! Eat more than you need and you will gain weight… too few and you won’t have the energy to do the things you love. 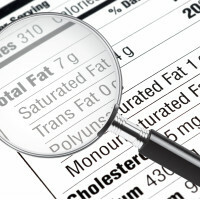 Total fat is the total amount of fat in a product. Remember if it’s fat free it doesn’t always mean it’s low in calories. You need fat to stay healthy, but it’s yummier from plant sources! Saturated Fat. The less the better. Less than 10% of your daily fat should be saturated. This is a big part in the promotion of heart disease! Trans-fat. Look for partially hydrogenated oils in the ingredients list. That’s the best way to find trans-fat in your food. If it’s there– don’t buy it! Cholesterol is close to saturated fat. They go hand in hand in food. Sodium is a fancy word for salt. Sometimes you have to be careful and not get too much! Fiber is my favorite type of complex carbohydrate! Both soluble and insoluble are listed here. Fiber is good! Helps keep digestion regular and keeps cholesterol levels down. GO fiber! Beans, lentils, whole grains and root vegetables! Sugar is a simple carbohydrate. You don’t want too much of this added to your foods as sugar or high fructose corn syrup! Whole fruit and milk have simple carbohydrates, but they are loaded with nutrients that our bodies need to grow! Fruit has a lot of fiber too!! Yum! Vitamins and Minerals are good for the body! We all want 100%, but keep in mind everyone’s vitamin needs are different… big bodies, little bodies, men and women. Percent Daily Value is based on a calorie level. Everyone has different needs depending on how old you are, how much you run around and find adventure, and even if you’re a boy or a girl! Ingredients are always a mystery. I’ve decided less is better! If I can’t pronounce them…. Well… maybe I should check them out before I eat them or avoid them altogether. Know what you’re eating by reading and make the best decisions you can for you and your body! Vist me on the Super Crew Kid’s site. Its so informative post. It gives lot of information about nutrition and calories requirement of the body. I just wanted to say good job. I really enjoy reading your posts. I have read the good article here regarding nutrition facts.From the concern information,I come to know the pure benefits of good supplement used for daily diet.I agree with the distinct points which highlights the proper nutritional facts. What a great blog! it’s definitely packed with highly informative info. 🙂 People look at food labels for different reasons. But whatever the reason, many consumers would like to know how to use this information more effectively and easily. The following label-building skills are intended to make it easier for you to use nutrition labels to make quick, informed food choices that contribute to a healthy diet. thanks for the post!